Home World News 'Mexico City policy has been reinstate by Trump withdrawing order from TPP. 'Mexico City policy has been reinstate by Trump withdrawing order from TPP. President Donald Trump on Monday will start to unravel the behemoth trade deal he inherited from his predecessor, as he signed an executive action to withdraw from the negotiating process of the Trans-Pacific Partnership. That executive action sends signals to Democrats and leaders in foreign capitals around the world that Trump's rhetoric on trade during the campaign is turning into action. 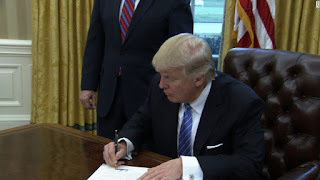 Trump vowed during the campaign to withdraw the US from the Pacific trade deal, commonly known as TPP, which he argued was harmful to American workers and manufacturing. The TPP was negotiated under former President Barack Obama, but never ratified by Congress, so withdrawing from it will not have an immediate, real effect on US economic policies, although it does signal a new and very different US outlook on trade under Trump. The other executive actions signed Monday included reinstating the Mexico City abortion rules and instituting a hiring freeze for federal agencies. Trump's action comes as the President is looking to change the conversation after a rocky first weekend at the White House, during which, he and his officials feuded with the press and his presidency was greeted with massive protests in the nation's capital and in large cities across the US. The executive action was just one part of the Trump administration's efforts to focus attention on its plans to radically reshape US trade policies, making good on a central premise of Trump's campaign and its economic nationalist underbelly. Trump on Monday also met with union leaders and blue-collar workers several hours after signing the executive action and had a separate meeting with business leaders. As the Republican nominee, Trump railed against free trade agreements he argued were lopsided against the US and vowed to implement more protectionist trade policies as president, rallying voters to the polls with his "America First" slogan. Trump has also threatened to impose trade tariffs as a way to revive American manufacturing and compel US companies not to take their manufacturing operations abroad. Obama's administration worked with the 11 countries that became signatories for more than two years to formulate the massive free trade deal that was set to reshape commerce throughout the Pacific Rim, triggering movement among multinational companies in the region at the same time. Trump's election swiftly dealt a death knell -- one formalized on Monday -- to the deal, sending shockwaves in Asian capitals that had pinned their economic hopes on the deal. Trump's decision to withdraw the US from TPP is also a first step in the administration's efforts to amass a governing coalition to push the new President's agenda, one that includes the blue-collar workers who defected from Democrats and flocked to Trump's candidacy in November. The move could also put many Democrats -- particularly those who opposed the trade deal -- in a tricky position as they look to hold on to union support, a key constituency in their political coalition. Obama struggled to sell many Democrats on the trade deal, in particular because of concerns about how the trade deal would impact American manufacturers and the US workers in that industry. Even Hillary Clinton, the Democratic presidential nominee who pushed the TPP deal as secretary of state, backed off her support for the deal during the campaign amid pressure from the left. Democrats with heavy union worker constituencies will either need to get on board with Trump's protectionist trade policies or risk losing reelection. Republican leaders, many of whom supported the TPP trade deal and free trade more broadly, will also be pressed to react Monday -- reactions that could show daylight between top Republicans on Capitol Hill and the White House on a top policy issue. Trump has said that he also plans to renegotiate the North American Free Trade Agreement, a free trade deal joining the US, Mexico and Canada.